As you are aware from the media, the ASTI has directed its members to withdraw from supervision and substitution duties with effect from 7th November 2016. This follows the repudiation by ASTI members of the Lansdowne Road Agreement. Health and Safety legislation and the in loco parentis principle place a duty of care on school management to ensure the safety, health and welfare of pupils. The Board of Management wishes to keep the school open if at all possible. To this end school management have assessed the supervision and substitution needs of the school and have put in place alternative arrangements for the provision of supervision of pupils. These arrangements were ratified at the Board of Management Meeting of Monday 24th November 2016. 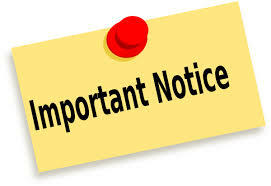 Consequently the Board of Management are pleased to inform you that Ramsgrange Community School will be open for all students on Monday 7th November and all subsequent days where ASTI members have withdrawn from supervision and substitution duties unless you are notified otherwise. However, this opening can only take place as all extra-curricular activities, trips, matches etc. and teacher CPD are suspended for the duration of the Industrial Action. The Board of Management/Manager wishes to assure you that it will continue to make every effort to provide education and care for our pupils and values your support in this endeavour.